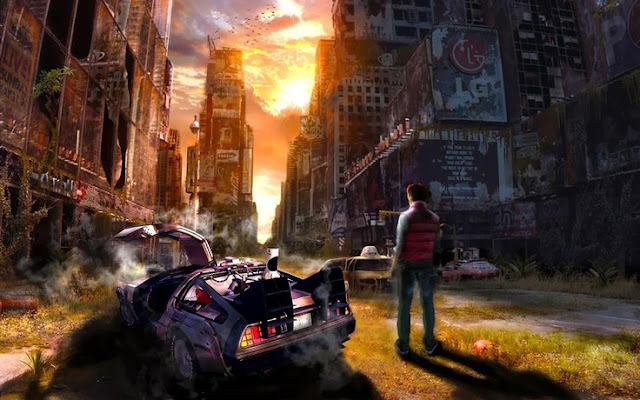 This summer, The NYC Warmonger's Club is running an 30K summer campaign. Awesome rules can be found here. As with all Campaigns, you sometimes end up with a couple players itching for a bigger fight. In this situation we also had an uneven group from different factions. Luckily we thought ahead and had a multip play territory available for mutli-play. 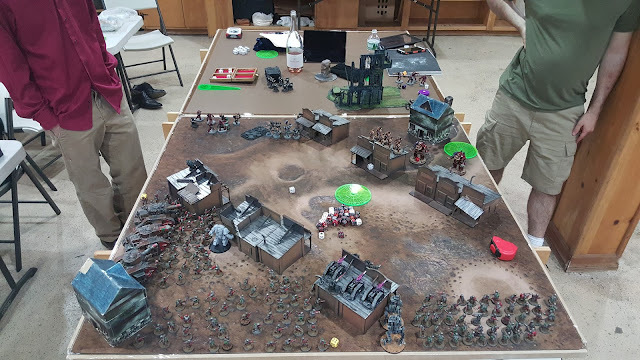 Traitors vs. Loyalist: 2000 pts, 1 full force org chart across all armies on a 4X4 table. 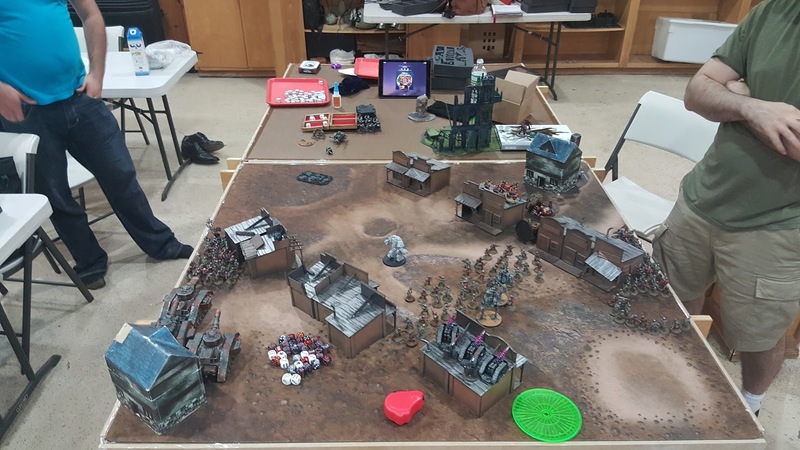 Only scoring unit score and contest deployment zones. Bright lights mask the murder in the shadows as Legions battle from all directions trying to control cross roads of Manhattan. 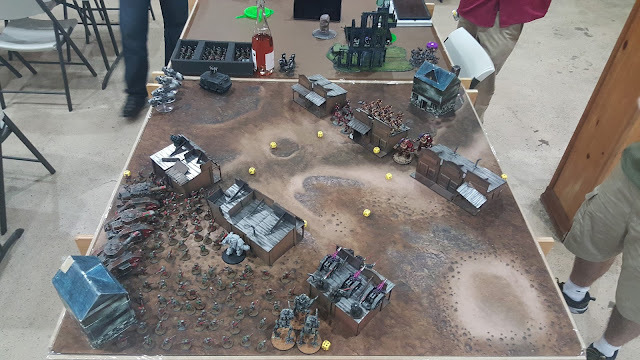 Bloody Square: This battle is always played on a 4’X4’ square board. Battle Zone: More than 2 players must fight for a battle zone. Total points per faction must be equal. The battle is worth 1 win for every 1000 total points in the battle. When the ball drops - Auld Langs Syne is a short range tactical nuke. At the end of each month, the faction that controls Times Square can eliminate a territory of their choice. This territory becomes a “No Man’s Land”. Note: For our campaign, we are ignoring the traitor and loyalist restrictions on army selection. This battle was played on a giant stage for the Broadway play Oklahoma. 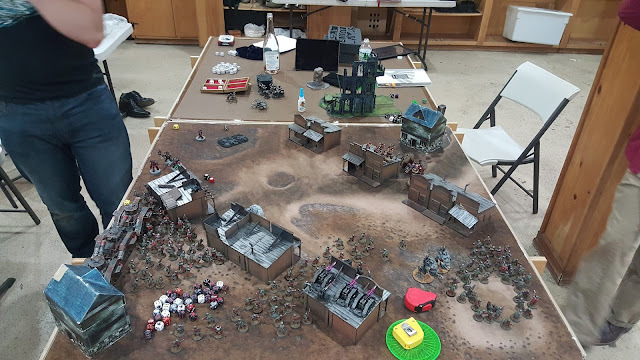 Alpha Legion Vets were deployed on the roof of the central building, 2 contemptors were deployed to the east and Gal Volbak with Zardu were deployed to the west. Ashen Circle and the the Rhino with tac support squad were placed in reserves. Leman Russes were deployed on the western board edge and the sentinels were deployed on the southern board edge. Saboteur was placed on the roof of the western building to snipe and the contemptors we deployed behind the central building. Grav Rapiers were placed on the roof of the most southern building. 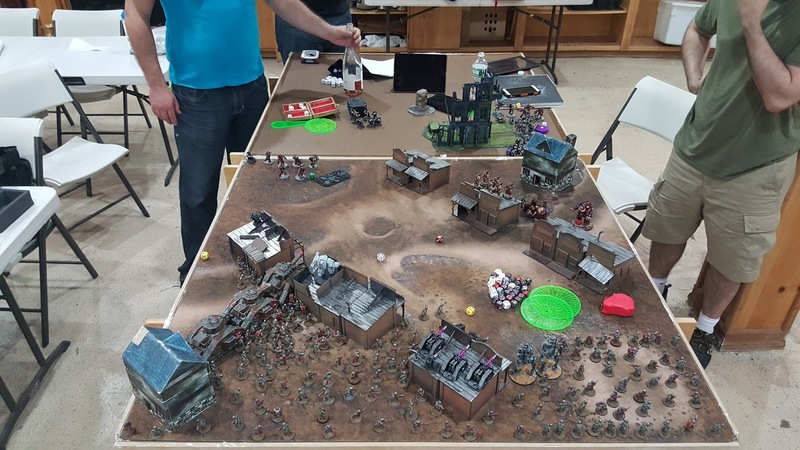 The rest of the deployment zone was filled up with 150 inducted levy and the force commander. Jetbikes were deployed in he north western corner of the board with the support of the Mor Deythan next to them (18" away from Gal Vorbak). The Mor Deythan and Jetbikes are set up as bait to encourage the Gal Vorbak and Zardu to run into the corner away from much of the battle. Leman russes will soften up the Gal Vorbak so the levies can handle them in hth. Grav Rapier and Sentinel will focus on contemptors. They are target #1 because they can lock the levy squad in hth for the entire game. To win they must die. 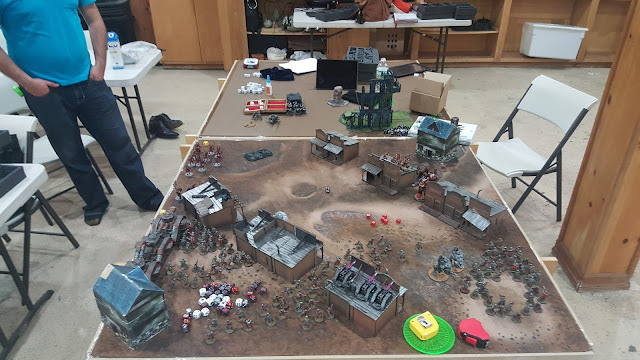 Traitors win first turn and loyalists fail to seize the initiative. The Gal Vorbak take the bait and charge the rhino of Mor Deythan blowing up the tank. The Mor Deythan pass their pinning check. Vets and Contemptors Kill a couple Levies. Mor Deythan rending flame the bunched up Gal Vorbak and kill half the squad with support from Jet Bike AP3 Heavy Bolters. They are AP3 due to the Militia's warlord trait. Leman Russes drop shells on the Alpha Legion vets kill a couple marines. Grav Rapier and Sentinel Lascannons remove 2 hull points from the contemptor and shake it. Ashen Circle Deepstrike onto the middle north edge of the board. Remaining Gal Vorbak Multi charge the jetbikes and Mor Deythan and kill them to the man. Vets continue to shoot Levies and Contemptors kill a Sentinel. Levies Shift to southern board to southern board edge to protect against out flanking vets. Grav Rapiers and Lascannons continue to shoot contemptors killing one and removing a hull point of the other. Ashen Circle move forward and Gal Vorbak run into the corner to summon daemons. But their call is unheard in the warp. Leman Russ line up to shoot the Ashen Circle, removing half the squad. The contemptor moves forward to act as a deterrent and bait contemptor bait. Levies continue you to spread out and cover most of the southern part of the board. Alpha Legion Vet Squad out flanks and kill a sentinel. Gal Vorbak move towards the Loyalist deployment quarter looking to do some damage. 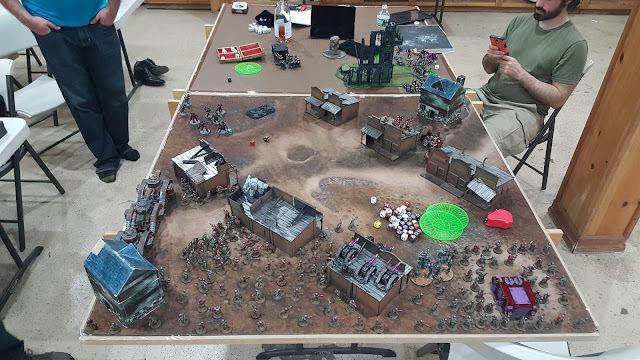 Sentinels blow up the rhino and levies clean up the unit inside in hth and sweeping advance toward the Traitor deployment zone. Central Levy squad moves into no man's land. Zardu FINALLY summons a unit of blood letters on the western board edge. The Gal Vorbak charge Western levy squad causing so many wounds it results in the combat ceasing to be a combat. Leman Russes blast Blood Letters off the board. The western levy squad charges the Gal Vorbak and kills off the units. The Eastern leavy squad runs forward to the Traitor deployment zone. The central levy squad secures no man's land. The sentinels and grav rapiers kill off the last contemptor. So everything went pretty much according to our battle plan. Gal Vorbak and Ashen Circle ran towards the corner which basically took them out of the game. The contemptors were also drawn out by delaying the forward progress of the levy squads. This allowed us to kill them with our heavy tank killing units. Bubble wrapping the southern board edge allowed us to deal with the outflanking rhino. In hindsight, the traitros could have played a very different game. Contemptors could easily have been hidden out of site and come out late game to tie up levy units before the got to no man's land. In addition, if less psychic dice were thrown at other power more daemon could have been summoned, which would have anchored their deployment zone and possibly won the attrition secondary objective. 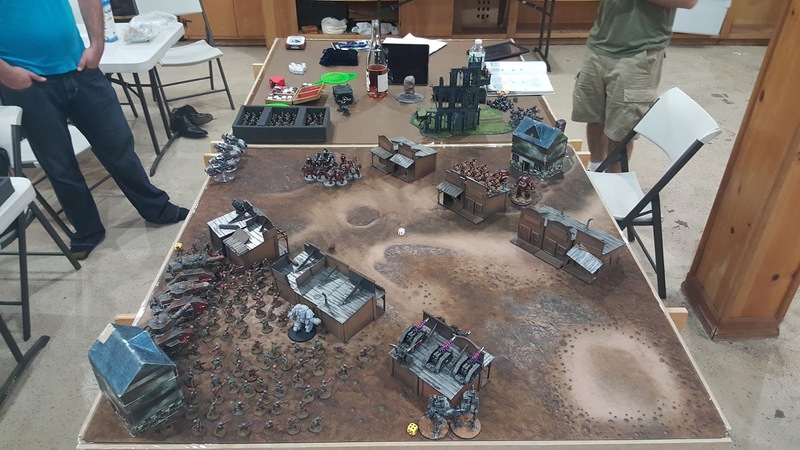 If I were the traitors I would have played for a tie on the primary objective, expecting that both sides would hold their own deployment zones and no man's zone would be contested and tried to flat out win by summoning and hiding daemon unts. Maybe you get lucku with late game reserves on the vets to contest the Loyalist deployment zone. As it was they larely played into our hand and lost because of it. Battle for Terra: The Emperor State - Ties!